For once, the baby picture you see here is not of Wee Cee. 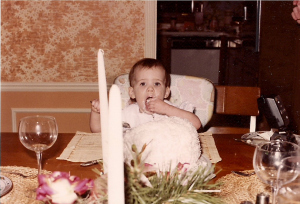 The child above is me, at the celebration of my first year on the planet. I was one, as C will soon be as well. Her first birthday is next month on March 31! WHAT? This blog was born because she started existing, so you can imagine that the hoopla that will be had here is going to be out of control. I’m making plans for her blog birthday that would make 25-year-old Emily groan. Well, 25-year-old Emily will just have to deal with it because 31-year-old Mama Emily is a putz for her baby. I need your help, though. This party will need to be populated. That’s why I’m asking you to send me your baby pictures. They can be of you as a wee one or of your own kiddos as babies. Or puppies. Puppies work too. I am flexible. Let’s keep it to age 0-3. Here’s the clincher: by sending me a picture of adorable little ol’ you (or your offspring), you will be entered into a drawing for a super awesome prize! It’s so super awesome that I don’t even know what it is yet! Exclamation points! I will pick it out though, since if C chose it you will all be getting receipts to tear up or boxes. So yeah. Please send your pics to thewaitingblog@gmail.com by March 27, 2013. Holy moly! That’s a lot of time! I am generous and unorganized, so I need time to be on my side. I may be disqualified. There is no evidence of me as a child in existence. I think it means I’m the Antichrist. Doesn’t he start off in his teen years? Actually I could probably just ask my dad for some pictures. Even the spawn of Satan has someone who loved him as a baby. A whole year…where has the TIME GONE!? I am gobsmacked by the passage of this year. It’s cray. My son’s birthday is on March 30, so it’s close to your little gal’s. I was so relieved he didn’t come on April Fool’s Day. All these excellent March birthdays! She came at 11:45 PM on March 31st, and the entire time I was pushing I was SO scared she would be an April Fool. That is not a day you want associated with yourself. That and Tax Day. Whoa! Talk about a close call! My sister was hatched on April 1. She’s the first born and a very alpha person — maybe that combo is why. I’m kinda with Carrie about not having the energy to do an archaeological dig for a pic of me from Way Back. Besides, I think a photograph taken by Matthew Brady might be too much of a fossil for your lovely site. The youngest picture of me I’m aware of is at about age 5. No, I am not sending that into the world. Looking forward to celebrating Wee Cee’s birthday though! Thanks, Stacy! The first year goes by WAY too fast. I was warned that it would but did I listen? Ha. I’ll be looking forward to your baby pics! Wow! March 31st? That’s almost as great of a date as March 28th for a birthday!! Looking forward to the PARTY! Your comment just made me snort coffee out my nose. LOLOLOL. Hahaha so were you! The baby pics of you on your blog are adorbs! Haha thanks, they make me laugh. I’ll have to send one for your birthday extravaganza. Would you like Cupid to make an appearance? Is this a costume party? He was a gnome for his first birthday (in fact, we all dressed as gnomes) but the pictures are all blurry. Oh my God time flies! Your little angel will be college bound in a blink of an eye! I’d love to be, as I always say, the fly on the wall who observes the event! You are most welcome to our shindig! OMG wow! Arthur is 8mths. So yeah, I can totally understand your excitement! I’ll be doing much the same over on C&H. And I am so totally sending you pictures of Arthur since you are awesome and C is awesome and he is awesome and the three of you should meet. Virtually. For Virtual cake. :) Can’t wait to see all the festivities! Virtual cake is the best. It doesn’t go to one’s hips, and it looks like all the pastries on Pinterest. Yay! Send those pics on! You always have such fun ideas, Emily. I’ll be sending a picture. I’m not sure who yet! Can’t wait to celebrate C’s birthday! Dude! I am in such a blur that I didn’t even realize that her birthday was Easter Sunday! OMG the possibilities of costumes are ENDLESS! As long as she’s happy to be a bunny, chick or Creme Egg, yes, endless! :) I’ll look forward to the outcome of that one! Oh how fantastic! Can I come? Got the perfect outfit! When do you want the pics by? March 27, s’il vous plait. WOOT. get ready for a bombardment of cuteness. I’m super excited for this. You always have the best ideas. You’re like the official WordPress Hostess with the Mostest. Oh, also, is the address in your email signature where I should send things? Because I’d like to send a birthday present to little miss grown-up C.
Holy moly is right! I’m glad I have a month now to look for a photo, remember to get it in an email, get distracted and forget to send the email, remember your blog post, look for the email in sent items, forget it’s in drafts, and look for another baby photo to repeat process. You are full of charming ideas and giveaways! Serious creativity. Hahahaha! Don’t worry! I can assure you that as the deadline approaches I will be spamming everyone with reminders to get their pics in. I can’t send you my picture FAST ENOUGH!! Squee!!! Okay my mom and I will get right on this! Don’t disqualify us! PS. C looks JUST like you in that picture. You guys will be twins. I wouldn’t disqualify y’all even if you only sent in pictures of boats or something equally random. I can’t wait to see them! I just read Lily’s comment. Lily and I are basically twins. We are of one mind. No, literally, it feels like that’s all the brains we got, just one to share between us. We’ll send in our photos pronto – we are nothing if not in love with ourselves, especially when we were so adorable. Another fun contest courtesy Emily!! Yay! Yay! One year old!! Where did this year go?! I’m sending over a pic of Gummy, of course. Luckily, my mom decided to put a crapload of my baby pictures on FB for my birthday a few years ago, so I’ll dig up one of myself too. ← Here’s a piece of paper with Batman on it. I mean, I love you.